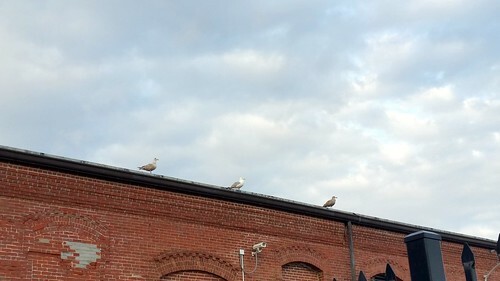 Three seagulls on a brick roof and looking in the same direction. You sometimes just stumble upon a scene that you feel like you might be interrupting. I happen to look up and saw these three seagulls standing there and all looking off at something. I found it curious for them to be standing on the wall with almost equal distance between them and looking in the same direction. I was also intrigued by three different feathering colors. The traditional solid white and solid gray stood in the middle. The one on the left is light gray on dark gray and the one on the right is almost solid grey. I also realized the security camera on the build was looking in the same direction. Could these seagulls be non-traditional security, ready to attack an intruder or trespasser? Now that, I need to capture on camera!